SPRINGFIELD, Mo. 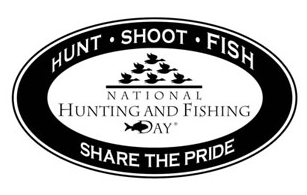 (August 26, 2014) – Only a month away, National Hunting and Fishing Day is the perfect opportunity to celebrate the conservation efforts of outdoorsmen and women across the nation. Outdoor enthusiasts everywhere are encouraged to participate at their nearest event. To find the event closest to you, visit http://www.nhfday.org. Always the fourth Saturday in September, NHF Day 2014 is set to take place on September 27 this year. Help us celebrate this special annual “holiday” established by Congress in 1972 to recognize hunters, anglers and recreational shooters for their leadership and contributions to the conservation in America. For example, through dues and contributions to conservation organizations, hunters give an additional $280 million annually for wildlife and habitat. Nobody does more for fish, wildlife and habitat than traditional outdoor enthusiasts. Communicating this message is a daily goal for all of us at Wonders of Wildlife museum—the official home of NHF Day—in Springfield, Missouri. National Hunting and Fishing Day is one of the easiest ways to recognize the conservation efforts of hunters and fishermen across the nation. It is also a great way to get youth involved in our great heritage. This year, U.S. Army veteran, country music star and award-winning TV host Craig Morgan is stepping forward to help promote NHF Day with all our national sponsors. He has been slated to serve as the honorary chairman for National Hunting and Fishing Day. Morgan is well known as an avid outdoorsman and also takes pride in serving others. He has made eleven overseas tours to entertain our troops and received the 2006 USO Merit Award for his tireless support of our U.S. soldiers and their families. The Tennessee native is also host of the award-winning “Craig Morgan All Access Outdoors,” airing brand new episodes Sundays at 11:00 p.m. ET on Outdoor Channel. The high-octane hit reality show gives viewers an all access, backstage pass to Morgan’s travels as he and his crew pursue big thrills and big laughs across the globe in a quest for the ultimate outdoor adventure. The first to suggest an official day of thanks to sportsmen was Ira Joffe, owner of Joffe’s Gun Shop in Upper Darby, Pennsylvania. In 1970, Pennsylvania Gov. Raymond Shafer adopted Joffe’s idea and created “Outdoor Sportsman’s Day” in the state. NHF Day could not happen without the help of great sponsors. The list of sponsors for National Hunting and Fishing Day 2014 includes: Wonders of Wildlife, National Shooting Sports Foundation, Bass Pro Shops, Realtree, National Rifle Association, Yamaha, GunBroker.com, Izaak Walton League, Ducks Unlimited, Limit Out Production, Scout, National Wild Turkey Federation, Smith & Wesson and Outdoor Channel. For more information, visit http://www.nhfday.org.